I’ve had this knife for several years now. And the one thing I can tell you about this, is that it isn’t a tool. See, most knives regardless of their marketing-defined purpose, are cutting tools. First and foremost, they are able to cut things and be used for many tasks. The SOCP doesn’t do any of that. The SOCP does only one thing. Stab. The blade is designed to puncture. And it does that very well, thanks to its needle-sharp tip. It does have some sharpening up the sides of the edges, but only to aid in penetration and to open the wound channel a bit. There is really no other utility going on here. And that’s okay. It’s a simple dagger, and free of ornamentation or frills. The markings are limited to standard Benchmade icons, and other makers marks. No decoration. No bling. Nothing else. It is skeletonized and skinny, weighing only 2.2 Ounces, with an overall length of seven and a quarter inches. The blade is three point two inches long. It’s made of 440C Steel, and then powder coated with some sort of black material that gives the surface some sort of texture to help the hand actually grip the knife. I’ve been tempted to hit this with some solvent and strip the coating and then blue the 440C and see how that looks. Okay, maybe tempted isn’t the right word. Looking for Time and an Excuse if I happen to have some solvent laying around. But that’s not here nor there. The key to this Weapon… Because, again, it’s not a cutting tool. This is purely a weapon. The key is the Sheath. This allows the SOCP to be carried easily, in a low profile manner, to keep this weapon instantly ready. They designed it so it could be carried as part of a MOLLE kit, with the dagger positioned with or behind other items in the loadout. I’ve talked about small guns being “Get Off Me” guns… with this, this is a Get Off Me dagger. The designer in some of his videos about this knife, repeatedly says that with it you can “Make Space”. Essentially, you stab the person enough till they back off a bit, and then you can draw your firearm and shoot them with it. The large ring aids in drawing, gripping, and retention when you are busy doing things other than stabbing with it. Guys, I gotta be honest. 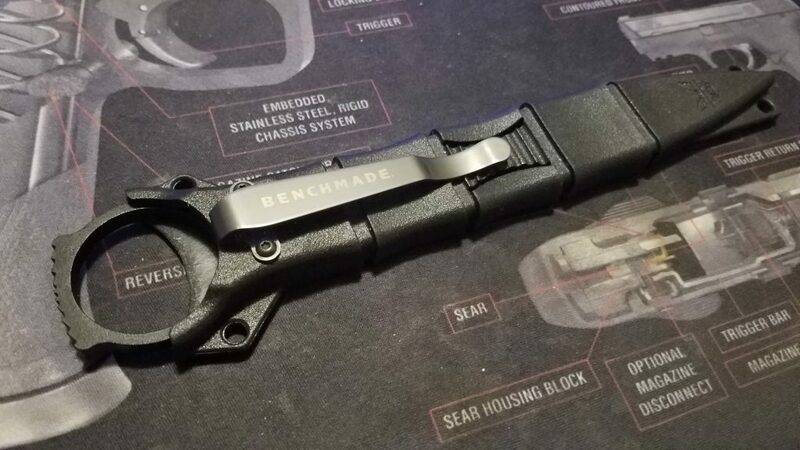 Unless you are an active duty SPECOPS kinda Operator or a Uniformed Police Officer in a predominantly Democrat City… This knife is just about completely useless. That being said, is so freaking cool that you just want to carry it everywhere. Partially just because it’s that cool. Also, to justify the almost 100 bucks that it costs. I’ll carry it inside the waistband, up front, appendix style, or I’ll clip it to my shirt between buttons, or I’ll carry it inside a jacket. This thing has practically always been with me. Just in case I have to Make Space. 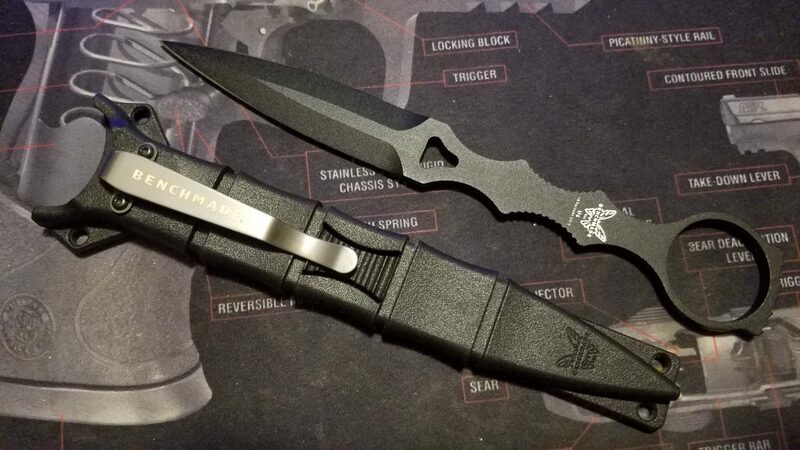 Now, I also frequently carry my Adamas Push Dagger as well. So, I do have some redundancy there. 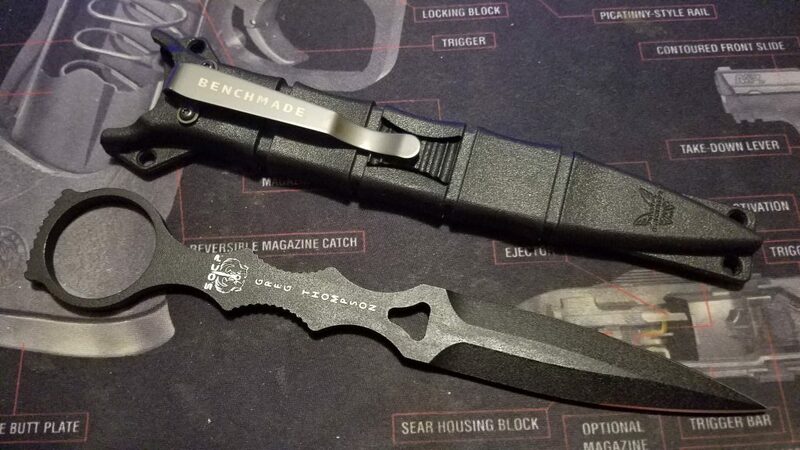 But if I was to have to get only one of these two Benchmade self-defense items… I’d buy the Push Dagger again, over the SOCP. OK. I get it. ( thumbs up ) Again, the sheath is impressive. Its nice to see a knife hit the market where the sheath is not just an afterthought .